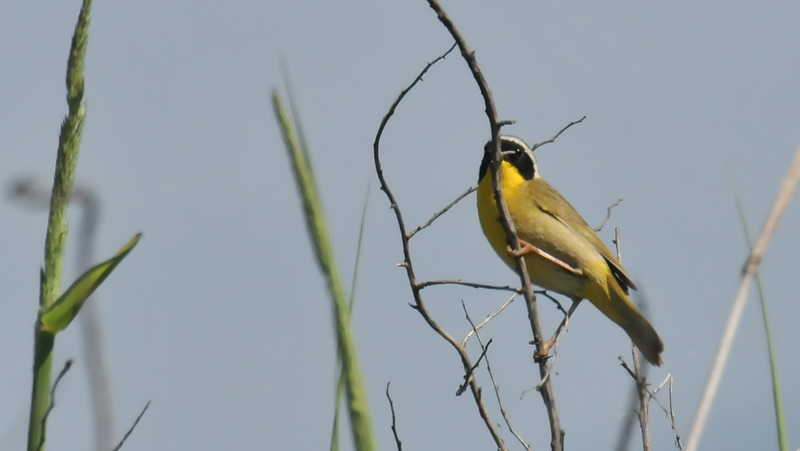 A Common Yellowthroat looking alert and ready for action. 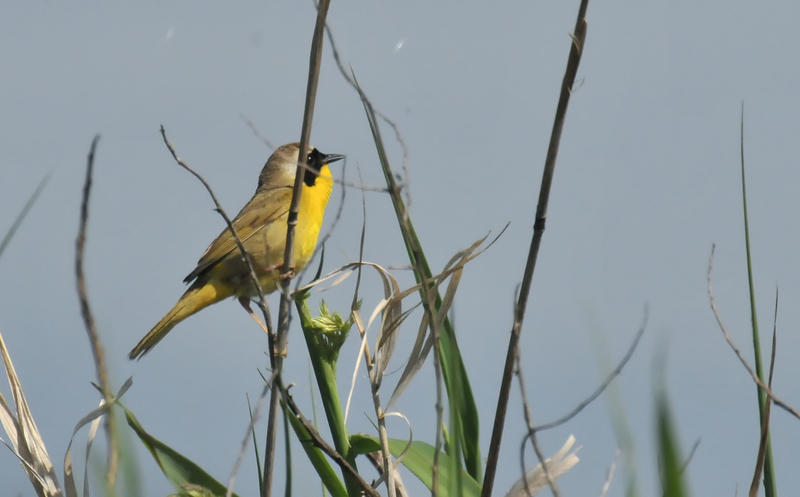 I usually hear this bird a lot more often than I see it. 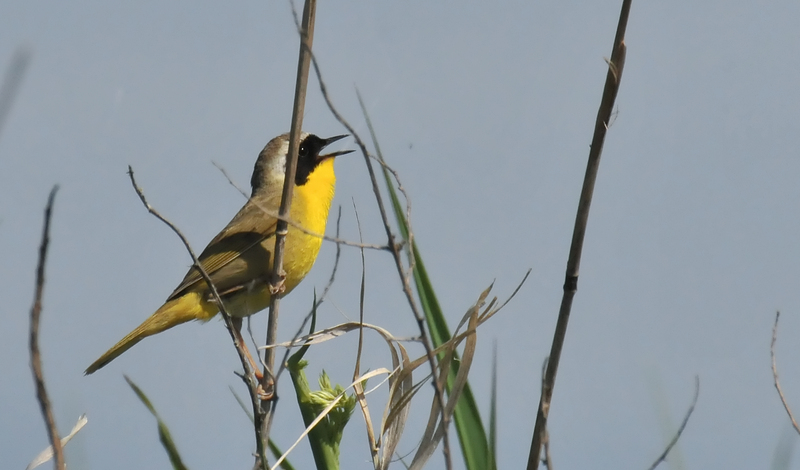 The Common Yellowthroat has a very cheerful, repetitive little song and you hear it from within bushes and brambles. 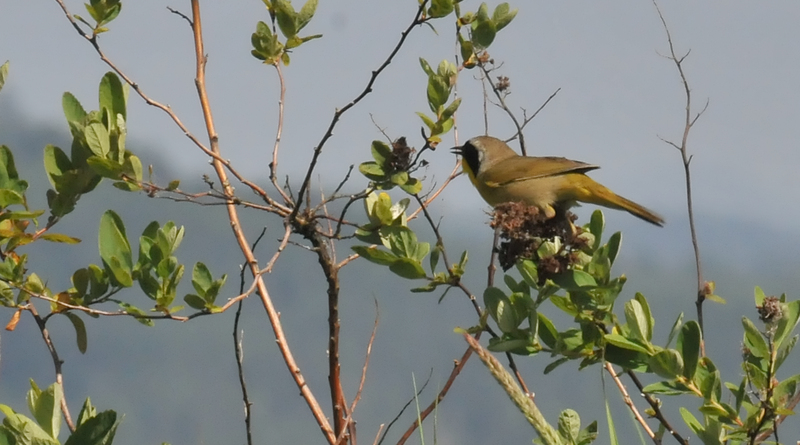 I felt so lucky to have this one decide to perform in the open. 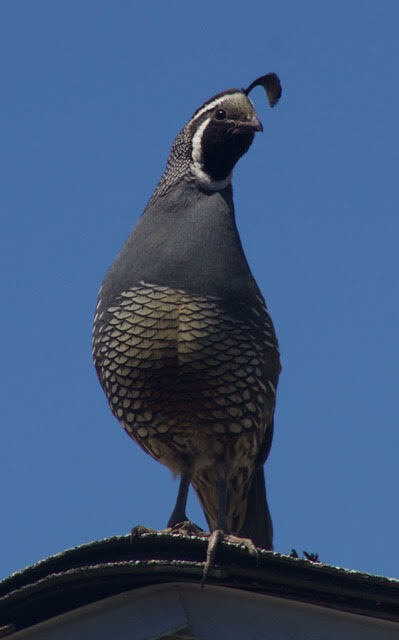 California escapee sitting on the roof peak of a house in Port Angeles, Washington. 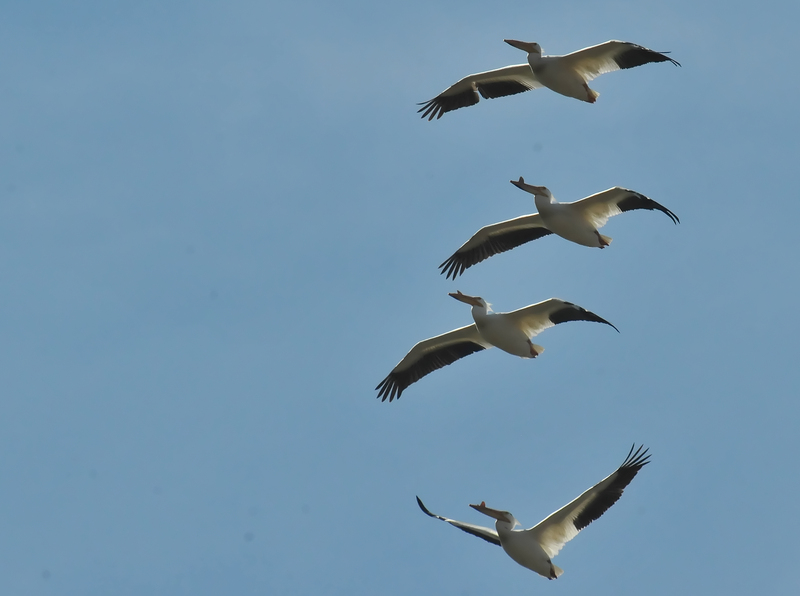 A short stack of White Pelicans. 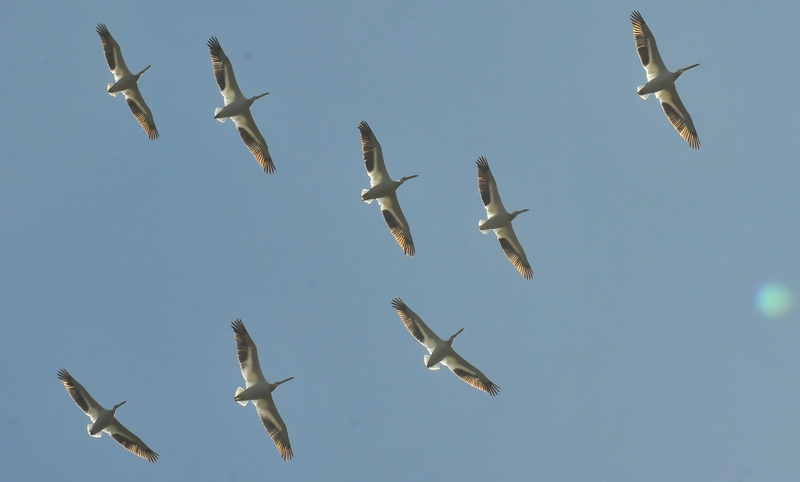 A lovely flock of backlit White Pelicans soaring over Fern Ridge. 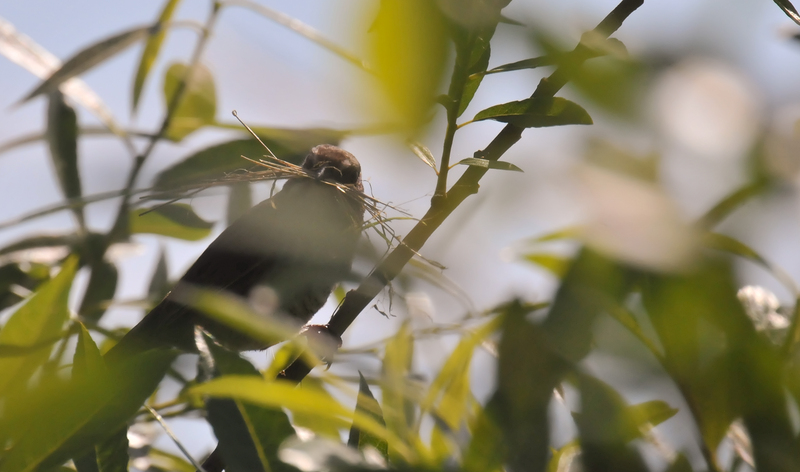 A Tree Sparrow with a bill full of nesting material in late May. 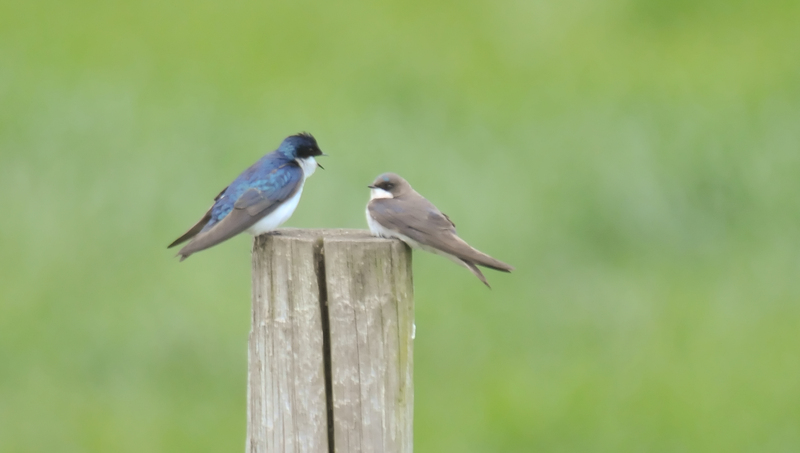 A pair of Tree Swallows mating atop a pole. Looks awkward and a bit painful. 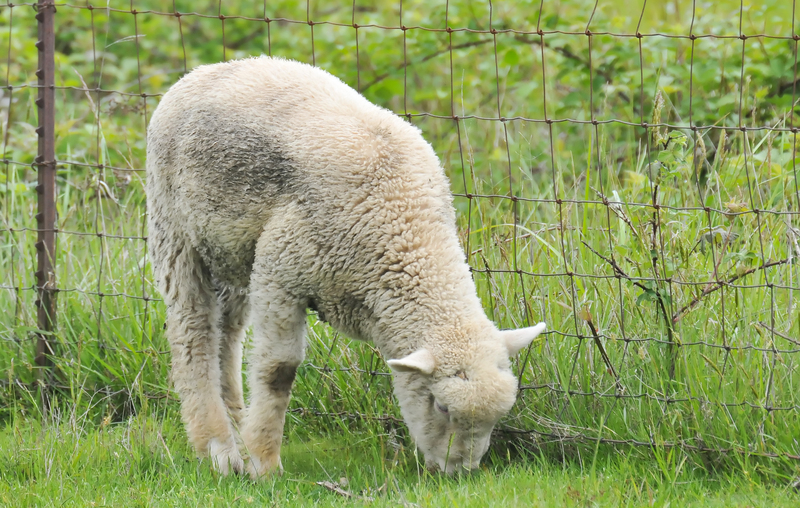 A spring lamb in a pasture off Royal Avenue. The surprisingly long tail of a lamb. 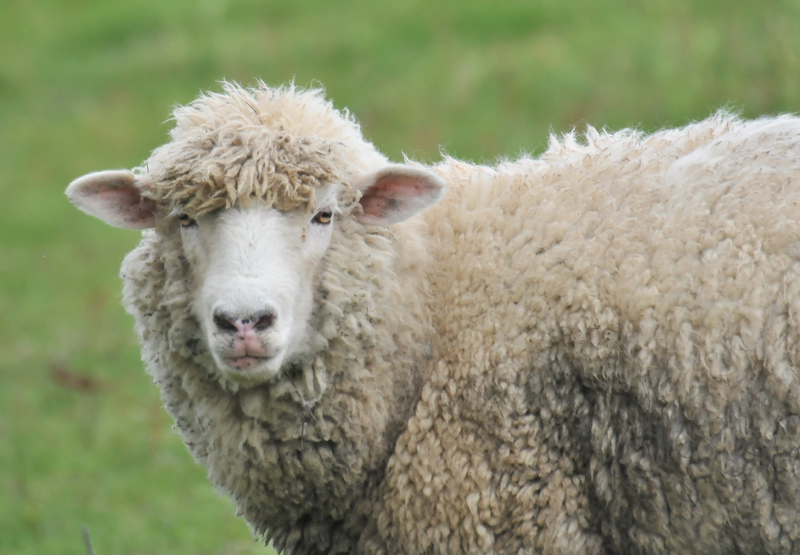 This sheep seemed curious and calm. 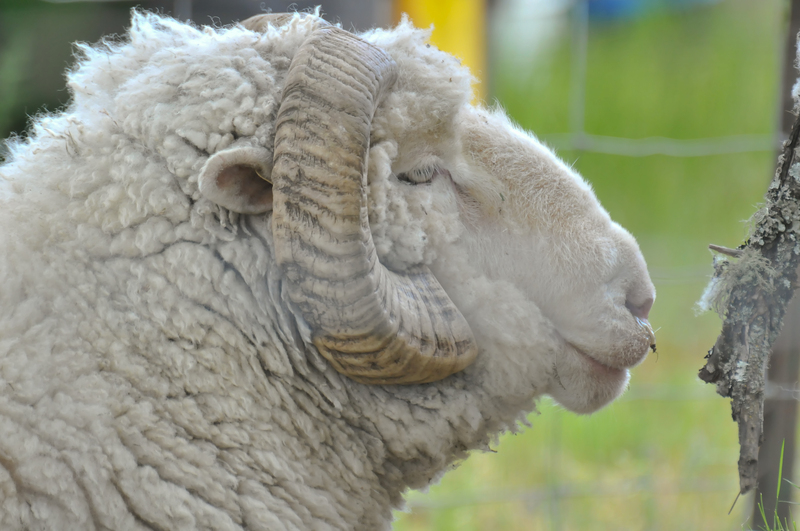 The solemn profile of a ram. 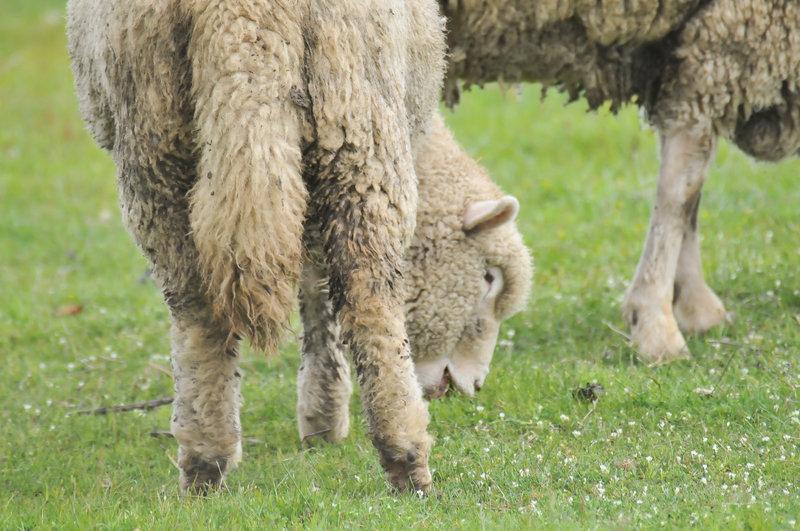 He was kept in a different pasture than the ewes and lambs. I took this photo from the car window as I was about to leave Fern Ridge. 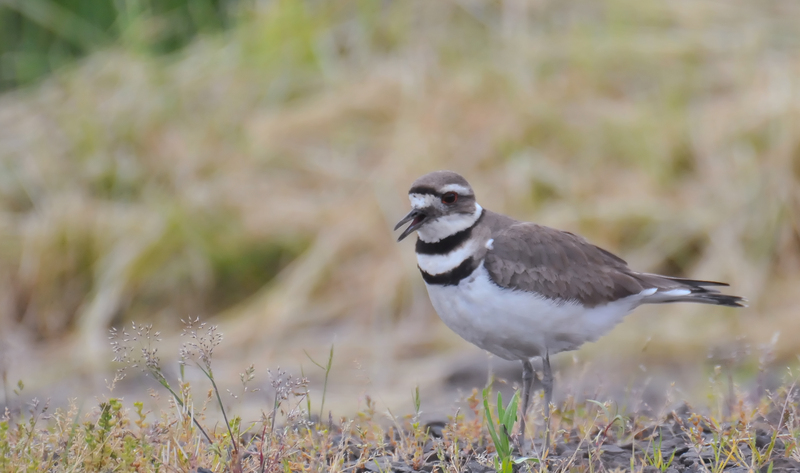 I heard the Killdeer, then saw it on the path scampering towards me. Sometimes they just want their picture taken. Three Great Blue Heron reflected at Fern Ridge mid May. 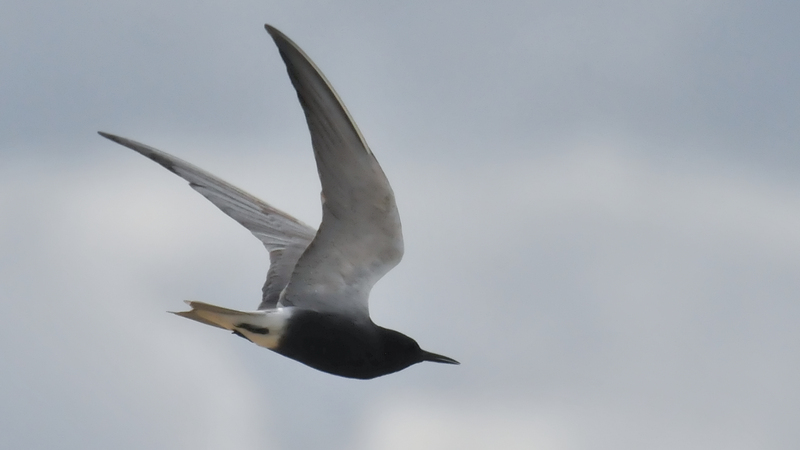 There were many active Black Terns at Fern Ridge that cloudy day. 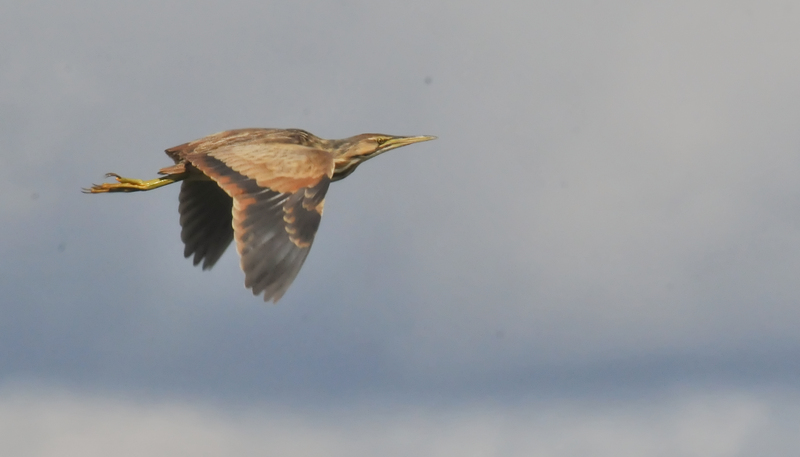 An American Bittern flew past while making very low-pitched grunting sounds. 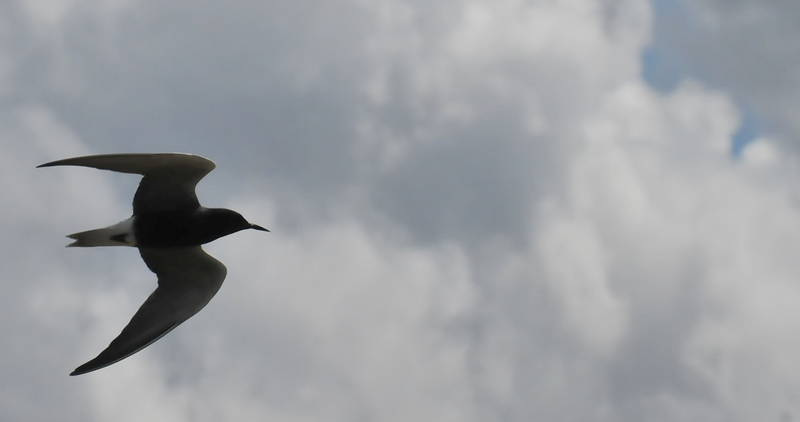 The male Tree Swallow seems to be proposing something to his mate. 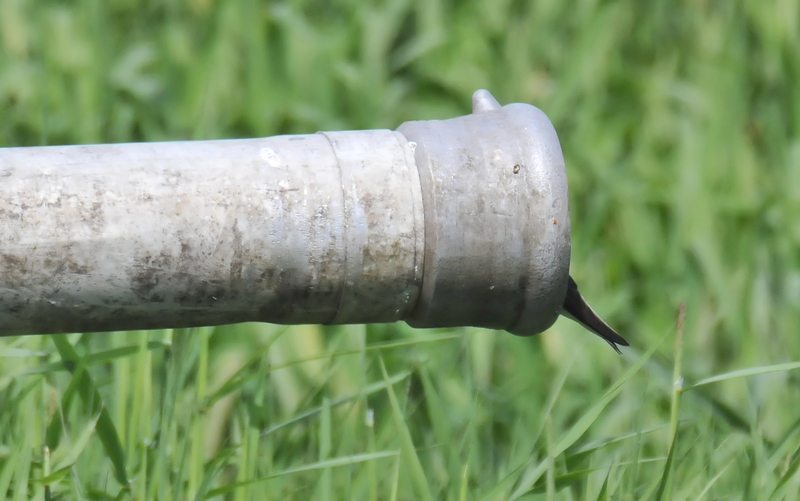 The nest of these two Tree Swallows was in a hollow pipe. The result of his proposal? 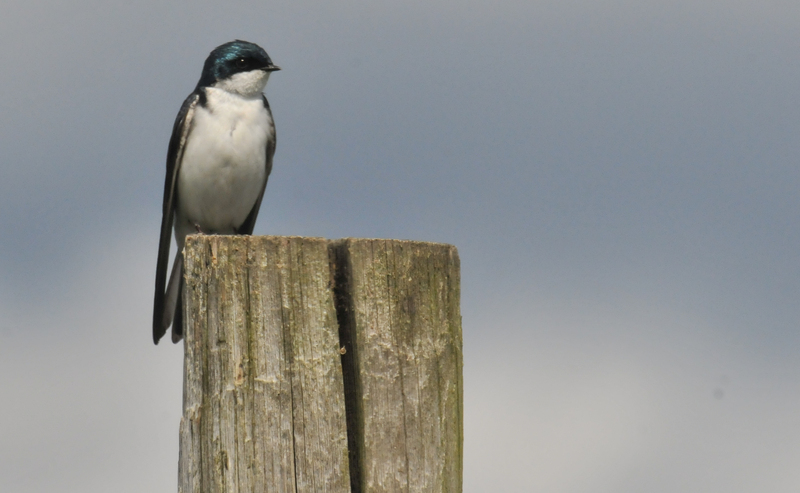 A male Tree Swallow atop a post at Fern Ridge. 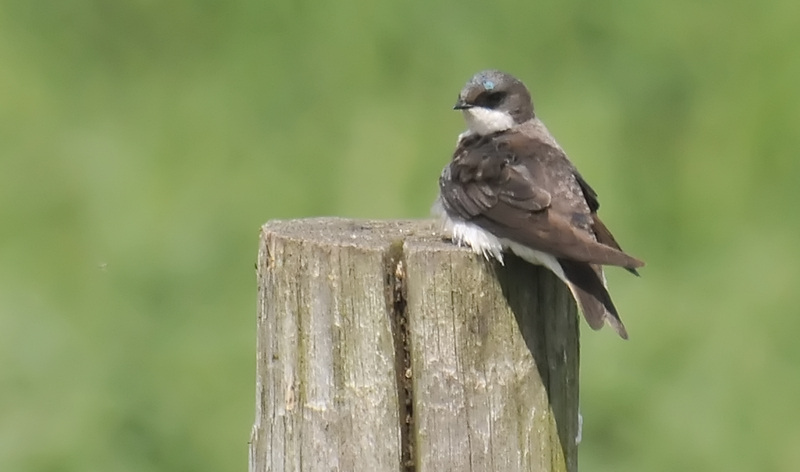 A female Tree Swallow atop the same post. 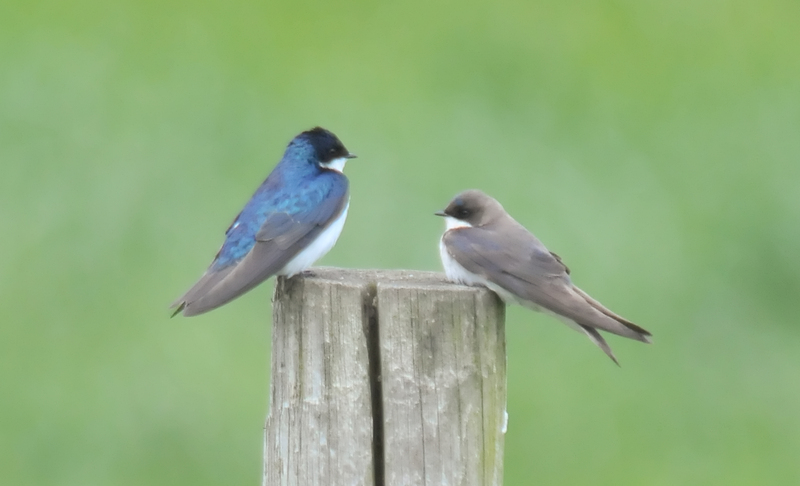 The same male and female Tree Swallows were a nesting pair. 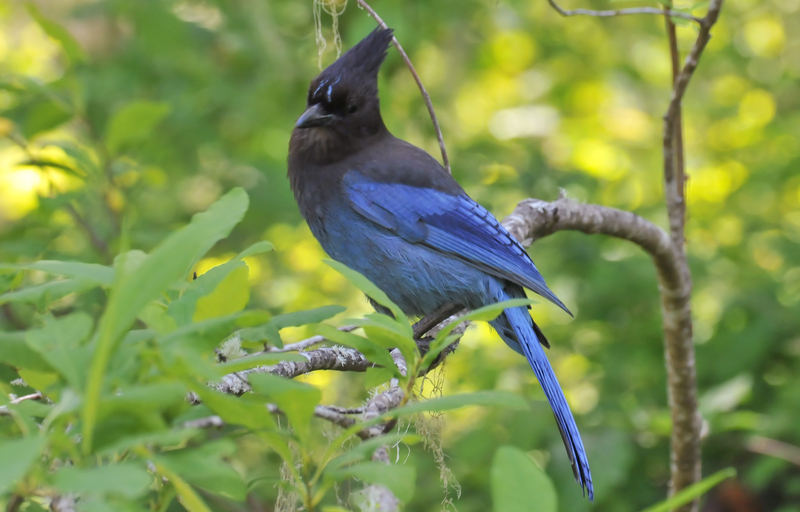 Another Stellar's Jay was quite boldly curious that day. 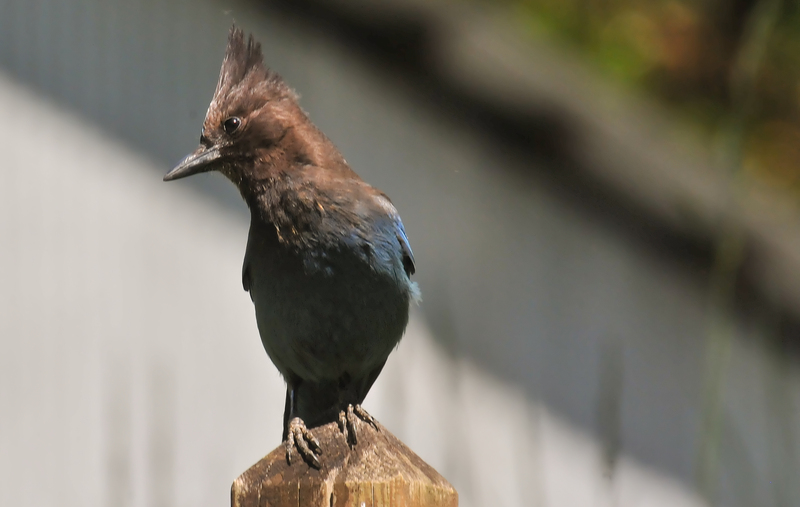 The handsome Stellar's Jay looking jaunty and ready for mischief. 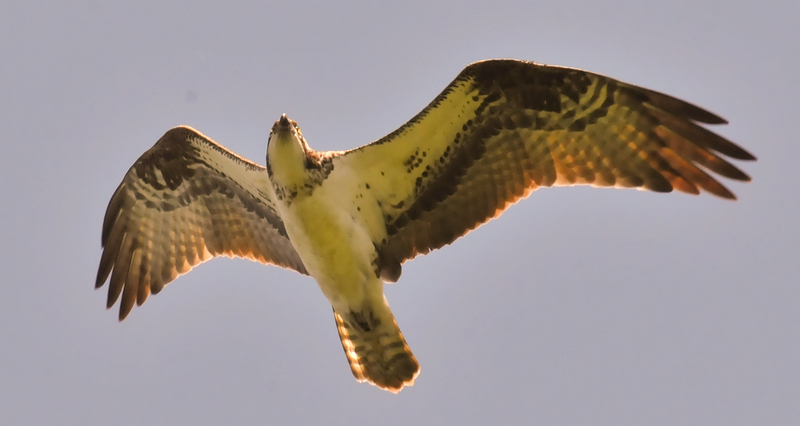 The morning sun gave this Osprey a lovely translucent look. 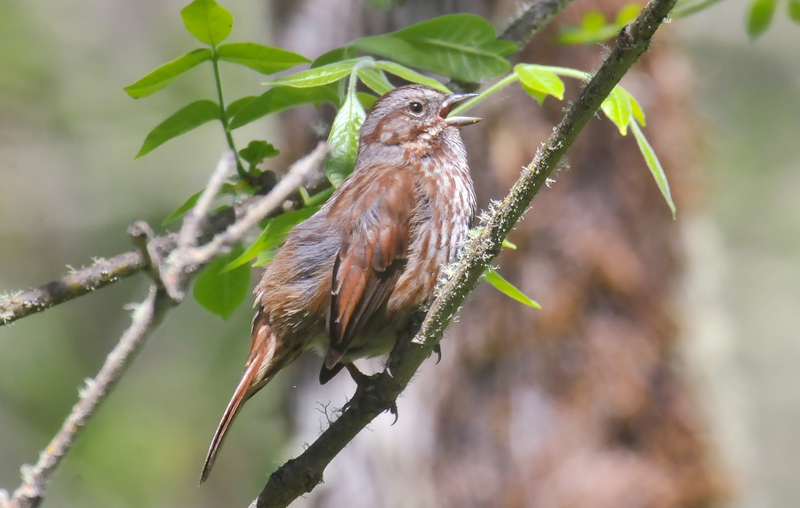 A Song Sparrow doing what it does best; singing! 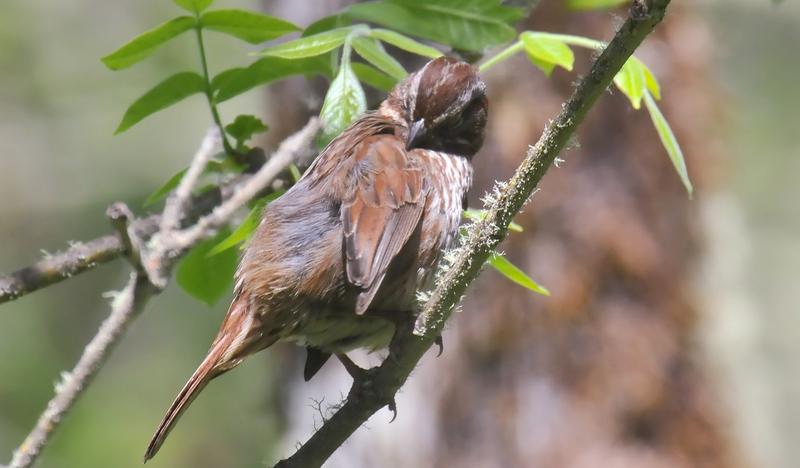 A Song Sparrow preens itself at Mt. Pisgah Arboretum. 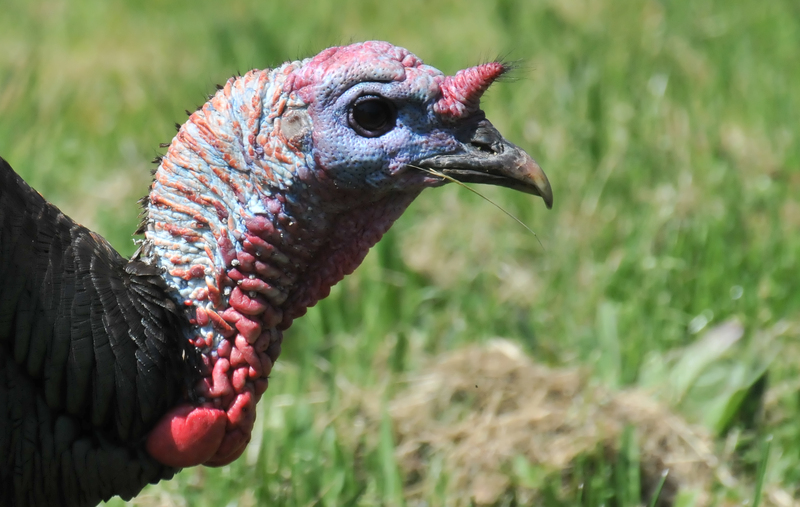 A close up of the horned head of a Wild Turkey. Not my kind of pretty. 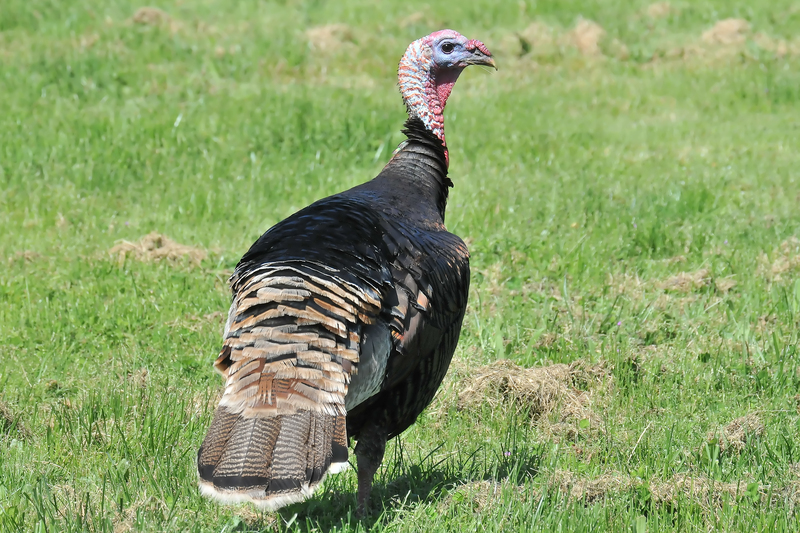 The Wild Turkey from the back. 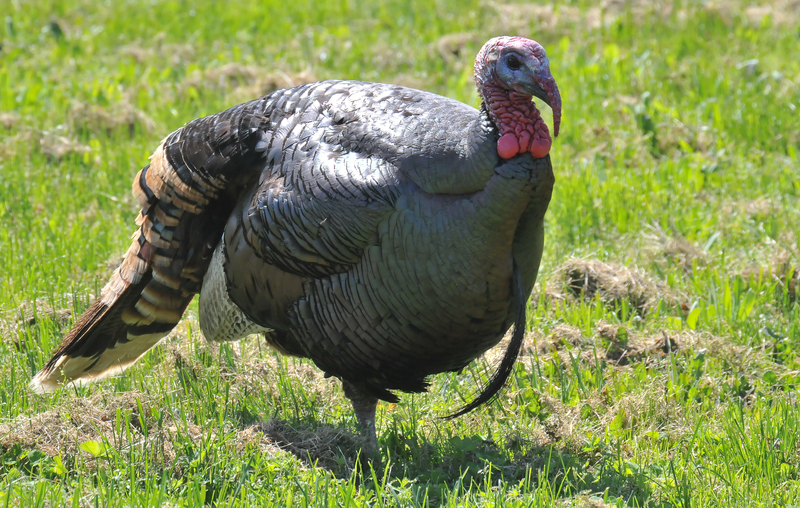 The back lawn of Lane Community College had the unusual ornament of a large tom Wild Turkey. 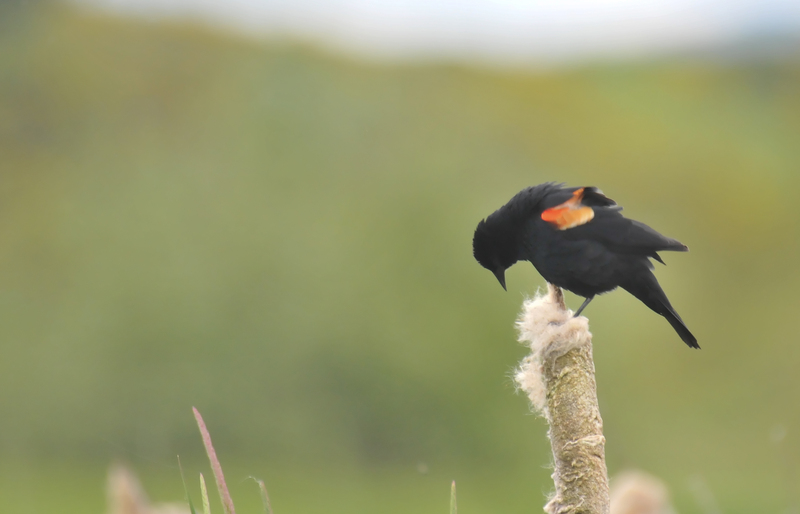 He didn't pay any attention to the students coming and going. 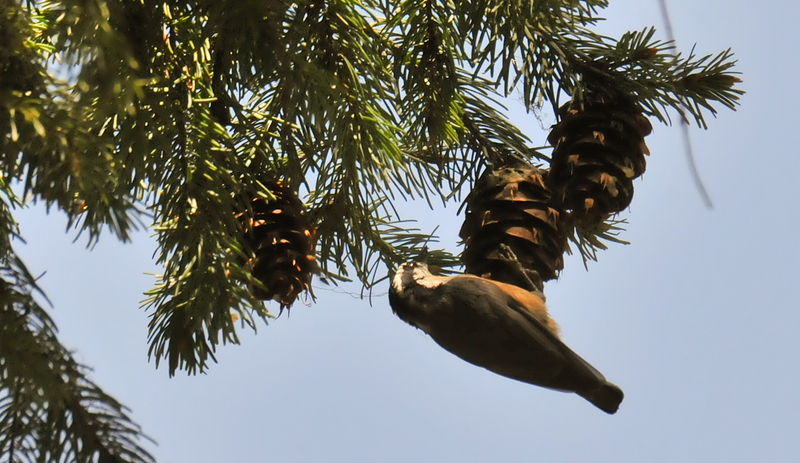 Very high in a tree, a Red-breasted Nuthatch hung upside down.